Laurent Gbagbo, Charles Blé Goudé and Chief Prosecutor of the ICC Fatou Bensouda. In a stunning decision Tuesday, the International Criminal Court acquitted former Ivorian president Laurent Gbagbo of war crimes charges. The ruling amounts to another major setback for ICC prosecutors in the first case against a former head of state at the Hague-based tribunal. The ruling comes amid growing doubts about the effectiveness of the ICC as a court of last resort' against the world's most heinous offenses. Gbagbo looked blank as he listened to the verdict of his acquittal at the International Criminal Court. But his supporters cheering in the public gallery forced presiding judge Cuno Tarfusser to call for order. The court found ICC prosecutors had failed to prove their case against Gbagbo and fellow defendant, ex-youth minister Charles Ble Goude. For Gbagbo and his backers, it was the end of a long fight — at least for now. Prosecutors can appeal the court's decision. The former president was charged with crimes against humanity in connection with violence that erupted after Ivory Coast's disputed 2010 election. The country's current president, Alassane Ouattara, was ultimately declared the winner, but months of unrest left a bloody footprint in a country that had already weathered a civil war. Gbagbo's lawyer, Emmanuel Altit, called the ICC's verdict a victory for justice and for a man wrongly accused. But rights activists like Amnesty International's West and Central Africa regional director, Marie-Evelyne Petrus Barry, do not agree. "There were 3,000 people who died following that conflict in Cote d'Ivoire, and the victims will not be able to see justice, they will not be able to seek reparations," Barry said. "And that's terrible because it keeps happening, and impunity keeps on being the rule." 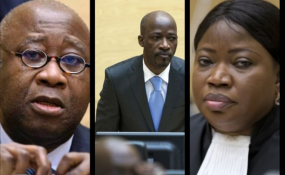 Critics fault the prosecution for a number of errors, including creating the perception of a one-sided justice — by failing to simultaneously treat alleged war crimes carried out by Ouattara supporters. The Gbagbo ruling is the latest high-profile loss for the prosecution. Last year, the ICC overturned a war crimes conviction against former Congolese vice president Jean-Pierre Bemba. Bemba tweeted he was delighted about the acquittal of Gbagbo and Ble Goude. The court also dropped charges against Kenyan President Uhuru Kenyatta and Vice President William Ruto for insufficient evidence — but neither man was acquitted, and the prosecution complained of witness tampering and difficulties obtaining information from the Kenyan government. Jim Wormington is West Africa researcher for Human Rights Watch. "The big challenge for the ICC now is to show it is an institution that is deserving of support," Wormington said. "Both for human rights groups like Human Rights Watch, for governments, but most importantly, for victims that put so much faith in this institution." What he and others fear is that victims on both sides of the Ivorian conflict will never have their voices heard or justice done — and the country will bury, but not come to terms with its crisis.